They were young, proud – and they were all that stood between defenceless settlers and the warring Comanche. They were the Texas Rangers, struggling to bring law and order to the infant Republic of Texas. Josh Sands is only twenty-two years old but has been with the Rangers for ten years. Ever since he was orphaned. Ever since he saw his family slaughtered by a Comanche raiding party. He has committed himself to ride with the Rangers until he can no longer sit astride a horse … or until a Comanche arrow stops him. Captain Jack Hays is a veteran, the greatest Indian fighter in the West. He knows that the only way to fight the Comanche is with their own brutal means, with Indian cunning. 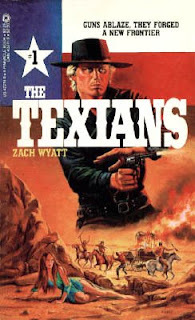 Zach Wyatt is a pseudonym used by George W. Proctor and this first book in the Texicans series is based around many events that really happened, so features many people from the history of the West, the main real person being Captain John “Jack” Coffee Hays. To include these historical events the book reads as a number of different incidents linked by the Texas Rangers and Proctor’s fictional character Josh Sands. After saving an escaped woman Sands begins to fall in love with her – being an orphan has left a yearning of wanting to be close to someone, a feeling he didn’t know was there until he saves Marion Hammer. Even so he has to fight feelings of revulsion towards her as she has been taken by the Comanche and, like many others, he sees her as unclean. So it’s this emotional struggle that ties the other events together. Proctor bases the rest of the story around three true incidents in the history of the Texas Rangers and San Antonio. The first being the introduction to the Rangers of a multi-shot pistol – the Colt .36 calibre “Texas” Patterson revolver – in which Sands and his fellow Rangers have no interest, until it’s worth is proved in battle. The second major event of the story is the killing of many of the peace delegation of Comanches on March 19th, 1840. This took place under a truce in San Antonio, which is now known as the Council House Fight. Proctor finishes the book with the Plum Creek confrontations during the beginning of August, 1840. Proctor does a great job in combining real events with a fictional storyline, which has me eager to read the second book in the series to see if he continues to mix historical facts in as major parts of the coming stories.